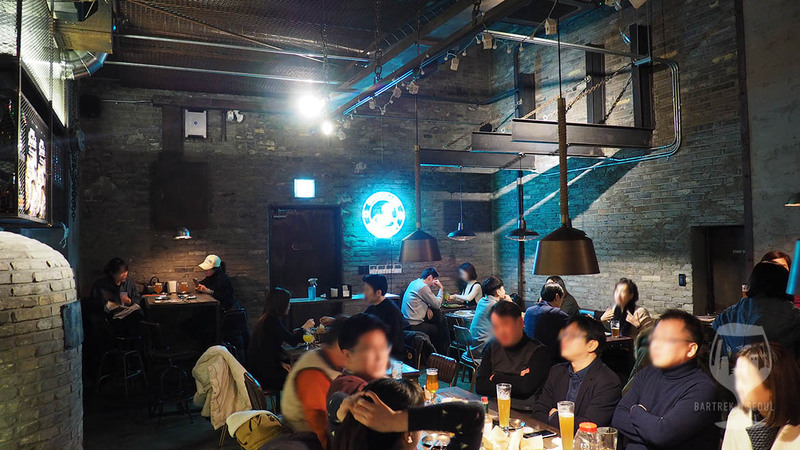 In a supreme Gangnam location, right outside Shinnonhyeon subway station, Beezza and Brewone join forces to set up a basement venue that does everything right. 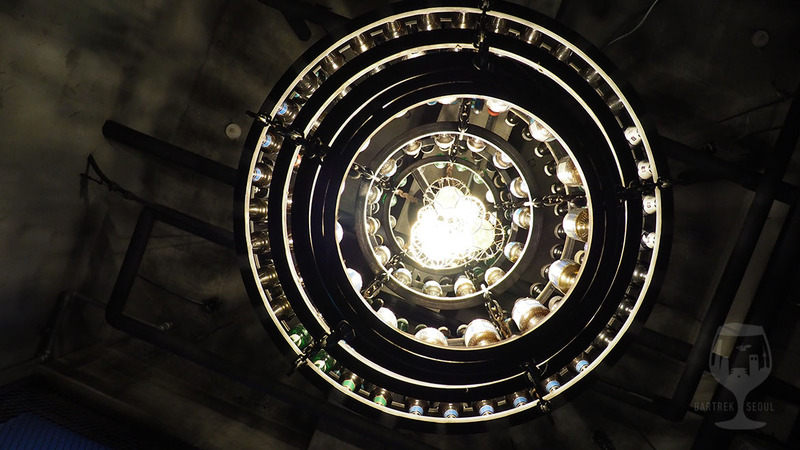 A dark and hip cellar with a high ceiling, industrial elements, a beer bottle chandelier and a menu with plenty of good choices for both drinks and food. 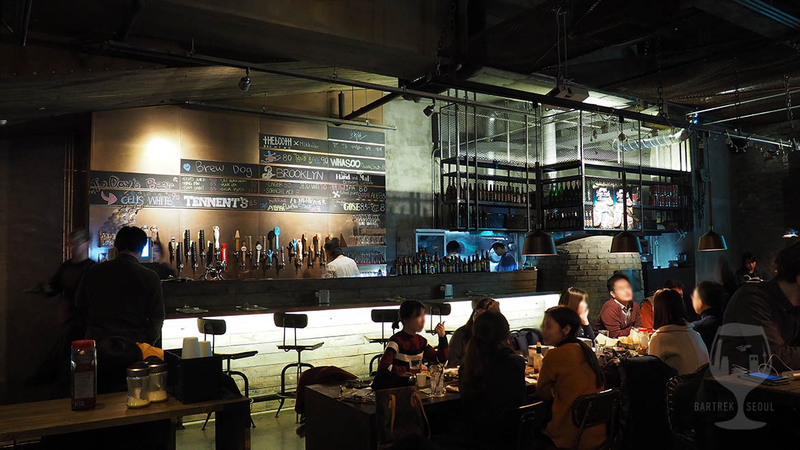 The beer menu includes Korean and import beers from large and small breweries and is sorted by type so you can get exactly what you are looking for. 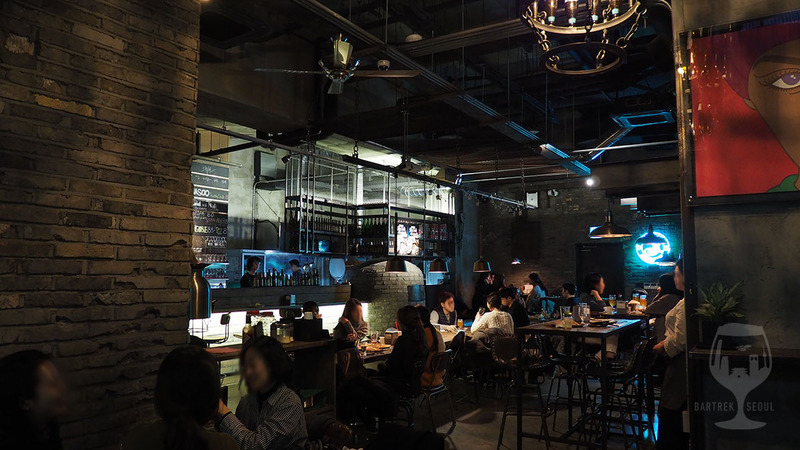 The industrial interior and really high ceiling create a perfect atmosphere. We started of with two beers from Brewone, the house brand, which should be about as fresh as it gets in their own venue. The I Hop So is, of course, extremely hoppy, with a great, sharp flavor, creamy foam and a refreshing, light body. Not too fruity, but with that bitter hop taste you would want. 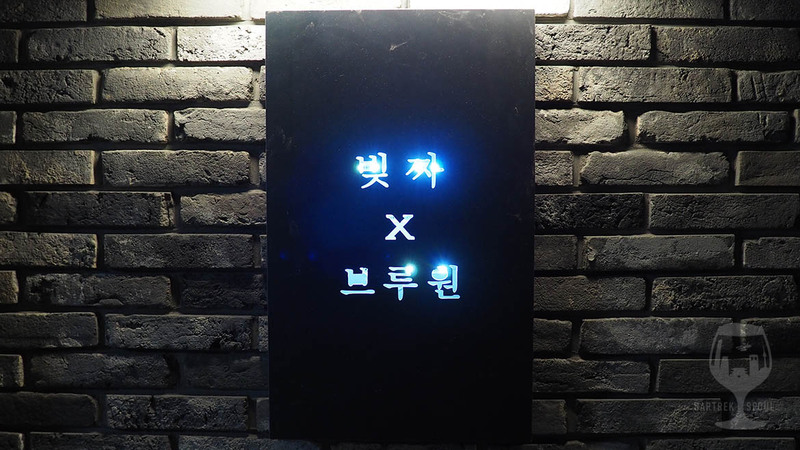 The Yeonnam is an amber ale with serious bite, the initial sips are sharp and carbonated, but the body is rich and malty with a lingering aftertaste. 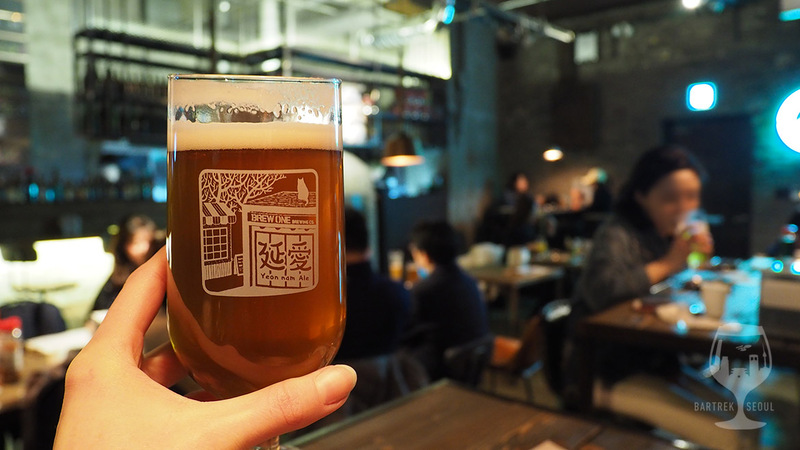 The beers are served in type-specific glassware, bringing out the full character of each brew. The counter and chalk board draft beer menu. 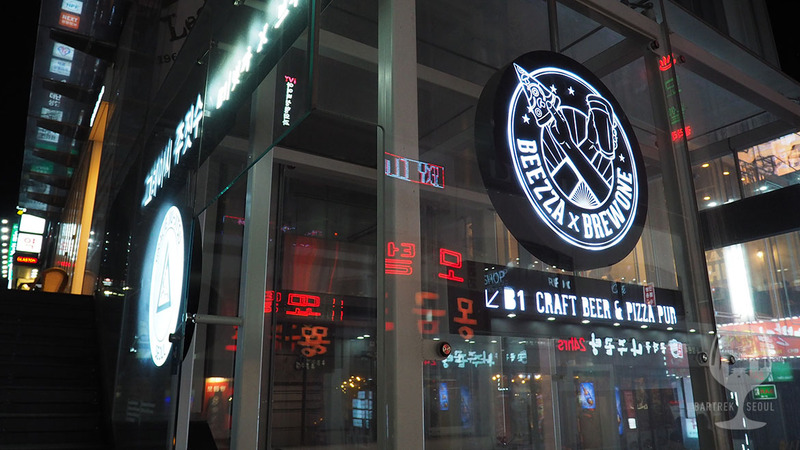 The beer selection is wide and prices vary from reasonable to Gangnam level. 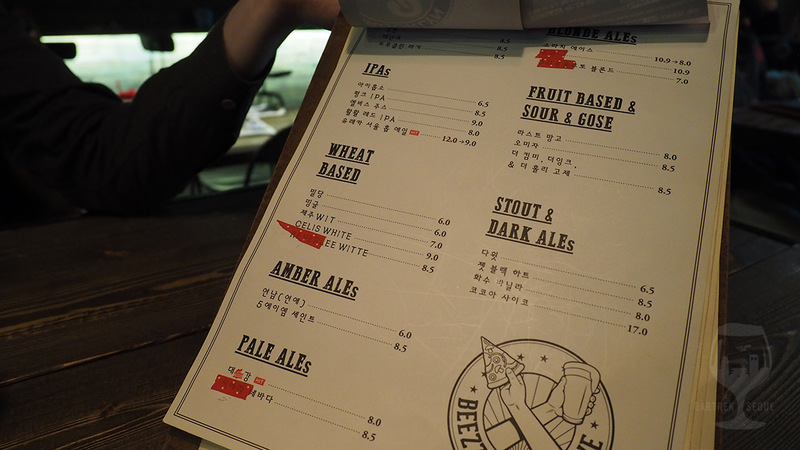 The beer menu is sorted by type, but the individual beer names are only written in Korean. 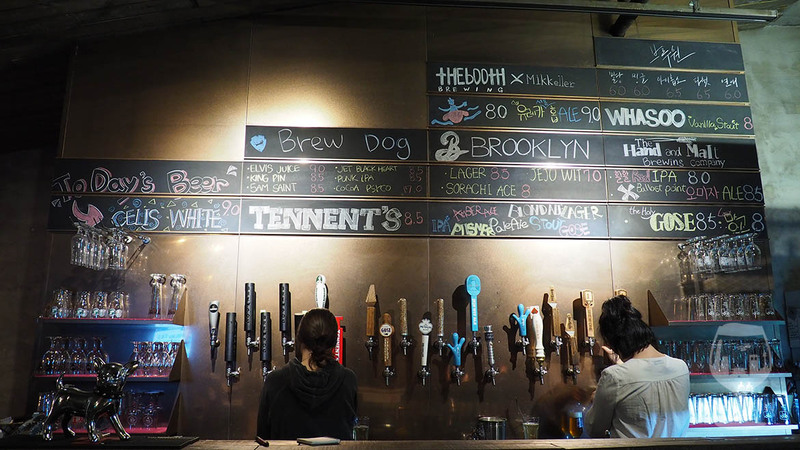 You can take a look at the chalkboard menu to see the same beers listed by brewery. 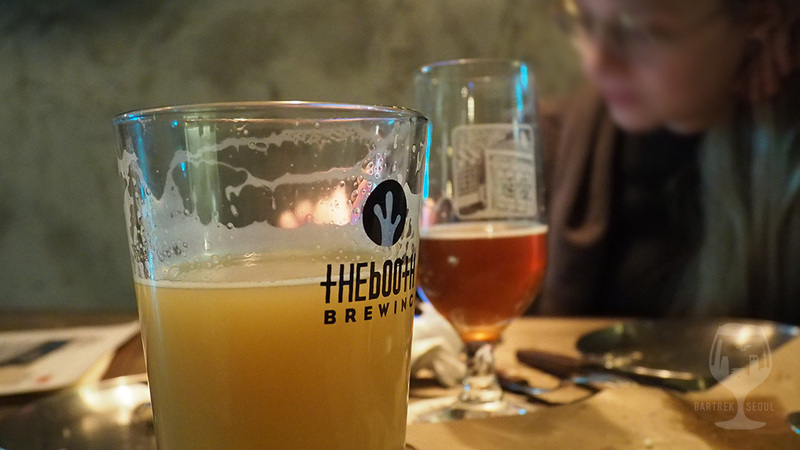 Most of the beers are in classic craft beer styles, namely IPAs and other hoppy brews, but the menu also includes wheat ales, stouts and even some sours and gose ales. Great for a party of beer lovers with diverse taste! A second hop heavy brew for the night, the Eureka Hop Ale by The Booth offers an overhopped flavor not very common in Korea. The beer itself is extremely cloudy, packed with bitter and fruity hop flavor, extremely fresh and even on sale at our time of visit. Very much recommended for hop lovers. 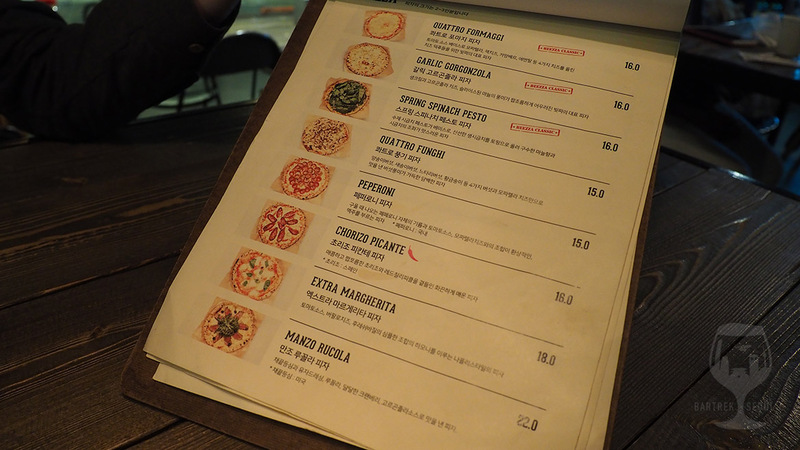 Beezza has a few other venues in Seoul and their pizza menu is on the thinner and crisper side with some classic toppings and some more unique. We got the Spring Spinach Pesto, which, as the picture shows, was more or less completely covered in fresh spinach. The dough is thin and crisp at the edges, good bready flavor blended with the pesto and spinach leaves and apparently doused in oil. Already an oily and intense flavor, there is also cheese and chili available to really ruffle your tastebuds, especially if you are pairing your pizza with a strong-flavored beer. The menu says one pizza feeds 2-3 people, but ours was just enough as a small, second dinner for two people. 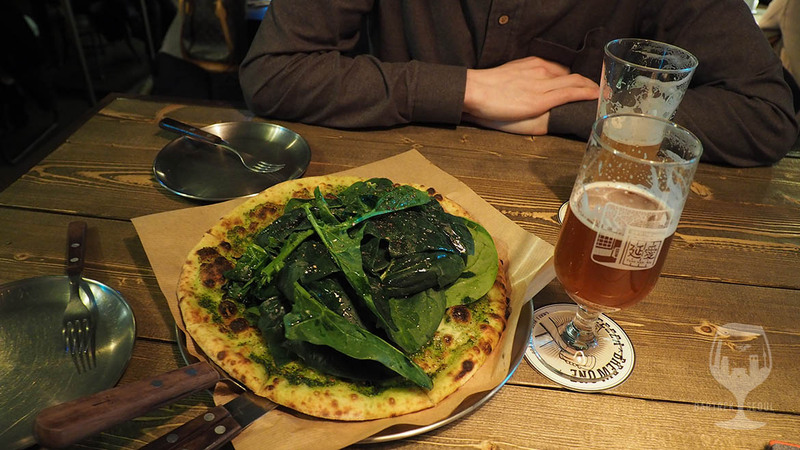 The spinach pizza was fantastic! 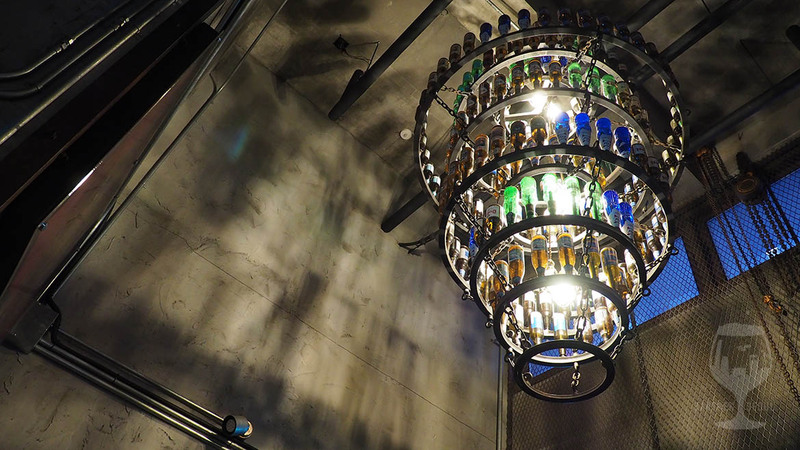 Beer bottle Chandelier at the entrance. The venue is downstairs in a cellar with a really high ceiling, exposing plenty of more or less original construction. Steel beams, chains, fences, brick walls, subtle lighting, neon signs and Beezza’s signature stone oven leaves little to be desired from the interior. 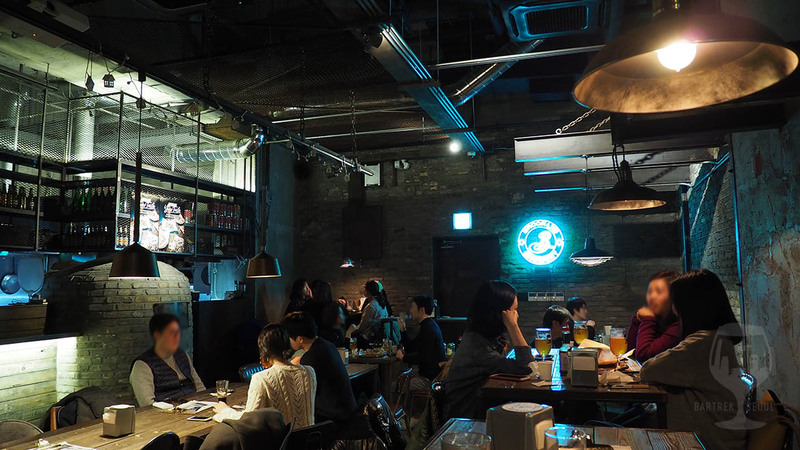 The seating ranges from smaller tables along the far walls to a long table in the middle for large groups, and of course the classic bar stools at the counter. The music is of course erratically jumping between genres, but at least the volume is moderate and the sound of high quality. Acoustics are on point, and though the place was lively and naturally filled up on a Friday, including a large group of laughing men, we could easily keep a comfortable conversation at our own table. Smaller groups chatting on nearby tables, and even some dating couples in the corners, good times were had by all. Another picture of the industrial, pleasantly brutal interior. The pub is underground in B1 floor. 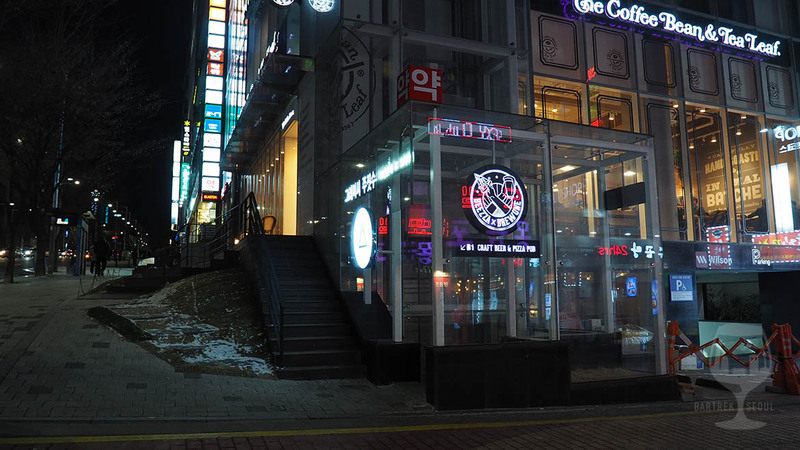 The entrance is right in front of Shinnonhyeong exit 4. 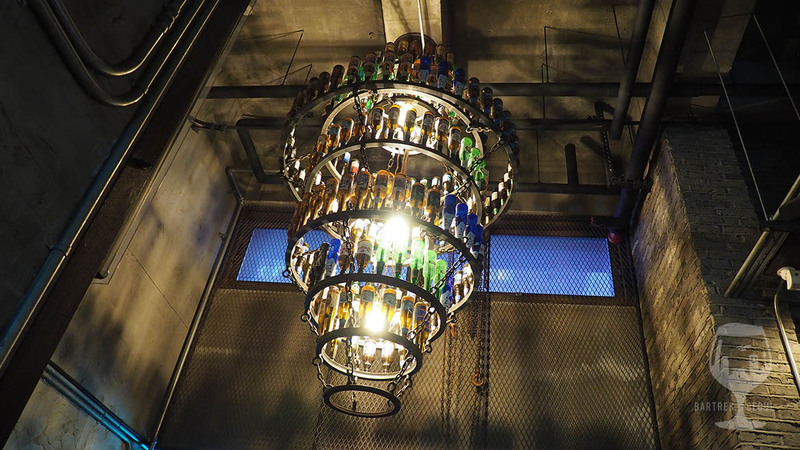 Another picture of the chandelier, which shows this place is all about good beer.